Skipping Rope Handles with Threaded Caps #3DThursday #3DPrinting « Adafruit Industries – Makers, hackers, artists, designers and engineers! 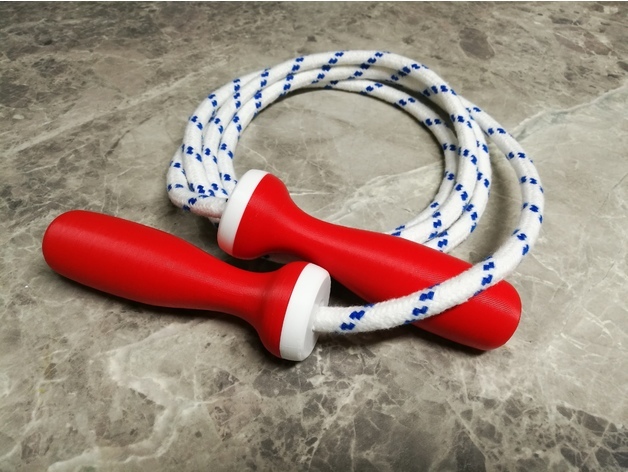 Skipping rope handles with detachable screw-down caps. UPDATE 02/03/18 – Modifed STL files for intended printing orientation. I created these for my 5 yr old daughter after she asked me to buy her a set from a shop… I thought I could do better (and for cheaper) so here we go. Should be fairly straightforward to print. PLA is fine for these. Print two each of ‘Cap Body’ and ‘Handle Body’ STL files. I printed them in different colours, as per photographs, for a nicer look. thread the caps on and tie a single simple knot to secure, trim and screw cap down to handle body. Repeat for other end, and enjoy!